Snow White Rising: Why This Princess, And Why This Moment? There are two Snow White movies scheduled for release this year, and Snow seems set to eclipse Cinderella as the fairy tale of the moment. Neda Ulaby investigates what makes this princess the one surging at this moment. Snow White is having a moment. 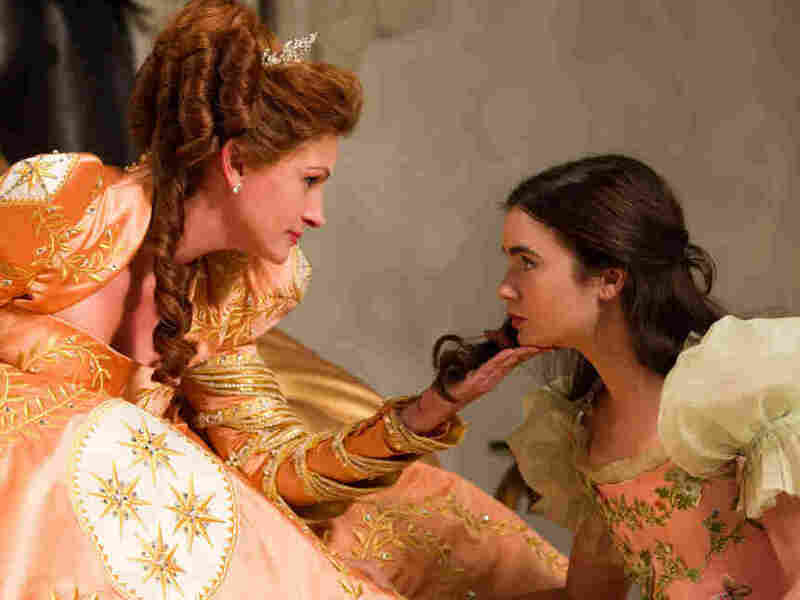 The new movie Mirror Mirror stars Julia Roberts as the Evil Queen. In June, another Snow White movie opens starring another Oscar winner, Charlize Theron, in the same role. And Disney is working on a new animated film loosely based on Snow White set in 19th-century China. So what makes Snow White so right for right now? Once upon a time, it was Cinderella who was Hollywood's hottest starlet. The Cinderella Story was cinematic catnip. The Princess Diaries, Ever After, Two Weeks Notice, Ella Enchanted, Maid in Manhattan ... and yes, yes, obviously Pretty Woman, when Roberts was a couple of decades away from playing anyone who might worry about wrinkles. But there's a new ingenue in town. She's fresh, she's frosty. And her image hasn't changed much since Walt Disney set the Snow White standard in 1937. Snow White is, of course, the story of a poor girl whose beauty earns her the envy of an evil queen. She's sent off to die and winds up in a coma, but she prevails, thanks to a prince and seven short hi-ho-ing men of some renown. After decades of the cold shoulder, why is Snow White suddenly white hot? Maria Tatar is a Harvard professor with an expertise in fairytales. "It may be that there is something about the boomer anxiety about aging that is renewing our interest in Snow White," she says. "In the Disney film, there's that terrible moment, that terrifying moment when the Wicked Queen drinks the potion, turns into an old hag, and we see the aging process." The new Snow White movie, Mirror Mirror, is also meant for families with young kids, just like Disney's version was. But screenwriter Melissa Wallack wanted to make the story contemporary. Part of that meant acknowledging baby-boomer grandparents' concerns about aging. "What's interesting now," Wallack says, "is that almost the first time really in history, you can remain young. Everyone now is out there shooting themselves with Botox." In the movie, in fact, Julia Roberts gets an Evil Queen spa special with scorpion bites, bee stings, bird poop and grubs digging around in her ears. Wallack says every time she opens a magazine or turns on the television, she sees actors like Angelina Jolie looking as young as they did decades ago. That was not the case for stars of an earlier generation, like Elizabeth Taylor, Lauren Bacall or Katharine Hepburn. She says ours is an age where chemical peels and other enhancements are pitched to almost everyone. "You can kind of stay in this state of youth forever," she observes. Charlize Theron plays the evil Queen in the upcoming dark adaptation Snow White and the Huntsman. The second Snow White movie coming out this summer is darker, much more high-tech, violent and visually sumptuous. It stars Twilight's Kristen Stewart as Snow White and Charlize Theron as the Evil Queen. The tension between the princess and the queen, says Harvard professor Maria Tatar, might also help explain Snow White's recent revival: "Maybe the mother-daughter rivalry that has caught our attention with so many women trying to remain youthful now." You can even see that, says Tatar, on a reality show fairy tale like Keeping Up with the Kardashians. It's filled with beautiful princesses, sham weddings — and, like Snow White, an older-versus-younger-woman dynamic. "The mother is constantly competing with her daughters for attention, and she's got these gorgeous daughters; she becomes more anxious than ever about aging." Tatar says fairy tales are a way to explore such elemental human concerns. What fascinates her is which ones bubble up and why. Right now, it's not just Snow White, she says. There are also a bunch of Sleeping Beauties in the works. She wonders — why Snow White right now, and why a "catatonic girl" like Sleeping Beauty? Maybe it's some sort of backlash, Tatar says, about women now outnumbering men in college or outpacing them at work. Or maybe it's not. Maybe there's a female fantasy about how great it would be to get to sleep undisturbed for a couple thousand years. The audio of this story incorrectly dates the Disney version of Snow White to 1939; previous Web versions have said 1939 and 1938, owing to conflicting information. Further research shows that the date assigned to the film by the Library of Congress for the National Film Registry is 1937.